Smart Home Network – Today’s average home has a plethora of connected devices. And all smart home products, such as laptops, smartphones, TVs, electronic door locks, and thermostats, require a solid, reliable networking infrastructure to function at their full potential. Plano Texas Handyman has the expertise to install a system to keep your home running smoothly, call Ted at 214.507.3415 today for more information on Build a Network for Your Smart Home or visit our website for all our capabilities. Smart Home Network. Most home networks today are usually comprised of an Internet connection to the house, which links to a wireless router with which everything else—smartphones, smart light switches, surveillance cameras—communicates. This setup functions adequately when the only products connected to the router are laptops and Xbox gaming systems. 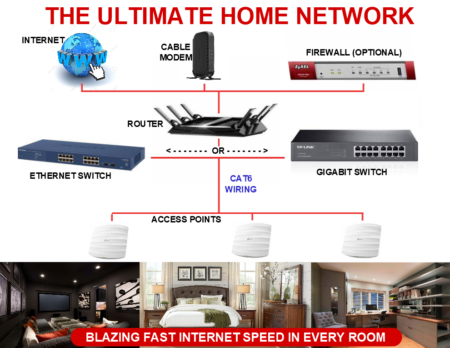 Today, in many households these legacy devices have been joined by a new generation of connected devices, including media streamers, home automation hubs, cloud storage services, security systems, and other products which the industry has come to refer to as the “Internet of Things,” or “IoT.” As the number of IoT devices on a home network increases, it becomes increasingly more difficult for the network to function well. Problems such as buffering in video streams, latency in music streams, and signals that don’t reach their intended destinations can result. Smart Home Network. A connected smart home generally starts with an incoming cable, fiber, or standard phone line (DSL). This wire connects to a modem and that connects to a router (or combined modem/router) which has Wi-Fi capability. Where that wire enters your home is important. If it comes in far from the central part of your house, like a deep corner of the basement or at the far end of a guest wing, latching on to that Wi-Fi signal is going to be difficult for devices located far from the router. To solve this issue, leave the modem provided to you by your Internet Service Provider (ISP) where it is, place a router in a central spot, and connect the two with high-quality Ethernet cable. Build a Network for Your Smart Home. For devices that stream HD video (as well as other smart home devices), nothing beats the communications reliability you’ll get from a wired connection between the devices and the router. This will involve fishing either Cat 5e or Cat 6 cabling to wall jacks in tech-heavy areas like a media room, home office, bedrooms, and a utility room where you might stow A/V and automation equipment. Terminating the wire to an Ethernet jack is straightforward. Match the wire colors to the jacks. Be sure to test the connection with an Ethernet cable tester. In areas where several smart home devices might exist, like a home theater, plan on plugging those components into an Ethernet Switch. An Ethernet Switch is intended to work in tandem with a router by connecting multiple devices in the same vicinity to your home’s network, and is able pass traffic through as quickly as possible without too much interference. A gigabit switch, like the Netgear Prosafe GS108, when used with a gigabit router will allow you to use your local network at speeds up to ten times greater than the previous generation (10/100 Mbps Fast Ethernet). If either of these components, however, is not gigabit rated, the entire network will be limited to 10/100 speeds. So, in order to use the maximum amount of speed your network can pump out, you need every single component in your network (including your computers) to be gigabit compliant. Build a Network for Your Smart Home. If you are building a new home you should plan on running at least two Cat 6 cables to each Ethernet jack (one for the network and one for future use). Locate these Cat 6 cables in places where you plan on putting your TVs, computers, security cameras, and other devices. And if you plan on adding a home control system, pull a Cat 6 cable to the wall light switch locations, as well. Should you ever replace these light switches with home control keypads, they can be easily wired into the network. Each run of cable is then “homerun” back to a central point, usually in an attic, basement, or garage. Here you generally will locate your router in a rack along with network switches and other gear. Plan to spend between $100 and $150 per cable drop. For a finished home, fishing cabling will be more labor intensive, and therefore, more expensive: between $150 and $500 per cable drop. 2. We think of your home’s network like a highway system. A wired network is a multilane highway. Multiple cars can have their own lane and travel at the speeds they want without impacting others. Not so with Wi-Fi. It’s like a two-lane highway. The slowest device dictates the speed of all the others. Invest in a router that supports both 2.4GHz and 5GHz. Having the second band (5GHz) helps as it gives you two additional lanes. Also available are routers with two 5GHz bands so you can have a total of four lanes in the 5GHz space. Smart Home Network. Today the most common Wi-Fi standard (third-generation) is 802.11n, which has a maximum speed of 450Mbps (megabits per second). The newest deployed standard is 802.11ac. It has a maximum speed of 1.7Gbps (gigabits per second). The good news is the ac standard is backwards compatible, which means that the devices you currently own (which most likely are n) will work with the newer ac-based wireless routers. Additionally, Wi-Fi works on two different wireless radio-frequency bands. The most common is 2.4GHz (gigahertz), and the newer and much less crowded is 5GHz. People who live in congested areas, like cities or neighborhoods, will certainly experience interference when using a 2.4GHz router, so be sure to invest in a dual-band model, which supports both 2.4GHz and 5GHz. Routers that support 802.11ac are even better. Smart Home Network. However, even the best router won’t ensure adequate Wi-Fi coverage, so in many homes it helps to add range extenders (often called repeaters, although they don’t actually repeat) and access points. Range extenders connect to your home’s network and then broadcast a new signal with a slightly different network name (often they add “EXT” to your existing SSID). This will allow you to connect to the web, and stream video or audio to new rooms of the house that your existing wireless signal can’t reach. Range extenders should be placed where a moderately strong Wi-Fi signal already exists to ensure that they can lock onto Wi-Fi and provide a stable extension. Multiple Ethernet ports are built into some range extenders and access points. On range extenders these ports can connect non-wireless devices to your network. This is called a Bridge. Network Bridges can also be purchased separately for the sole purpose of connecting a non-wireless device to your network. Access points connect to your home’s wired network, thus negating the performance issues of range extenders. They can be set to the same SSID as your main network and can provide a seamless roaming experience. Multiple access points can be added, even outdoors (be sure to look for weatherproof models). This is the preferred way to extend a network. Smart Home Network. Be mindful of Wi-Fi limitations and understand that the more smart devices you add to a wireless network, the more bandwidth will be used. You can beef up the bandwidth with a high-quality router and complementing it with range extenders and/or access points. Still, Wi-Fi can be finicky so, whenever possible, connect your home’s smart devices via a wired network. Depending on your home, you might not be able to fish wire to every device, but this could still help lighten the load of your wireless network and enable it to function more reliably. Plano Texas Handyman has the expertise to install a system to keep your home running smoothly, call Ted at 214.507.3415 today for more information on Build a Network for Your Smart Home or visit our website for all our capabilities. Smart Home Network.